So here is a pretty neat statistic. Today is the day when SGL becomes, by some standard at least, the longest work in literary history. That’s not quite fair. SGL is non-fiction, so whether it is literary or not is hard to say. But it is an auto-biography. Short of reference books, the longest work is not Proust, that many people expect, SGL and some other things blow that away. Until today, a bizarre Super Smash Brothers fan fiction novel (I have no idea if it is written by a single author or not) was the longest known work of literature. But as of today, SGL pushes over that barrier to become the top dog, at least for the moment. Of course, one has to ask if a blog truly counts. Is it a single work? Does non-fiction count? But if this was a traditional media of pen and ink and called a journal then it would clearly qualify. Of course as with any record, one has to wonder how many longer works exist that no one knows about. Most people do not know about SGL, and I do not know about that many other blogs. Are there loads of blogs out there that are even longer? Not likely. Since I have been writing almost daily for almost twenty years (okay, one month short of nineteen years at the moment) and since I write rather a lot per day, there is a far better chance than it might seam that SGL might truly be the top dog for a single author, single piece of work. The scope of my writing here is rather unprecedented. What is really the more interested statistic is that for the last many years, we are pretty sure that I have been the most prolific writer in the IT industry as well. With around four hundred thousand posts, a few books, loads of magazine articles and blog posts, my writing level outside of SGL is actually many times larger than it is within SGL. SGL has been around longer with me writing essentially constantly since February of 2000, but my IT writing has been nearly continuous since around 2009 (so ten years at this point) and by 2010 it was already being suspected that I was writing more than anyone else out there. And things have only picked up over time. But, for whatever it is worth, this is a pretty big accomplishment even if it does not break any official record. If I stay healthy, SGL is still “only at the beginning.” One of my big regrets is not having thought of doing SGL earlier in my life. Five or ten more years of it would have made it so vastly more interesting. I wish that I had a clearer record of those years. Now that I understand just how important it has been to record the last nineteen, it is sad that the same records don’t extend back to my youth. I hope that my children learn from this and decide to write in a similar fashion. There is so much unique value to this. I managed to sleep in a little, getting up around nine today. Put in a couple of hours before making myself a bagel with cream cheese for breakfast. Dominica decided that the bad weather was mostly north west of Fort Worth and that she would have a clear enough drive up from Houston so packed up the girls and got on the road a few minutes before noon to drive back up to Dallas. It is still cold and rainy today. The yard is under water, as it always is. The old firepit thing in the back yard is a tiny pond now. Very strange. So Paul and I started doing dishes, laundry, cleaning, and other things to make it look like we had been cleaning all along. Dominica and the girls were home before four. They made really good time! There was a huge minivan load of stuff for the house. It was pretty well packed. There was a lot of Christmas stuff in there to bring in. So, once again, even with all of the work that I did to make space in the house, everything is full again. To make some extra space, we took the giant box of donation stuff out and put it in Paul’s truck to have it out of the way. We have several donation boxes full at this point. The kids spent the entire evening hiding, Luciana in her room and Liesl in mine. They were really ready for time to themselves after a few weeks with their cousins. Liesl hid on the floor on the far side of the bed so that she could basically disappear! 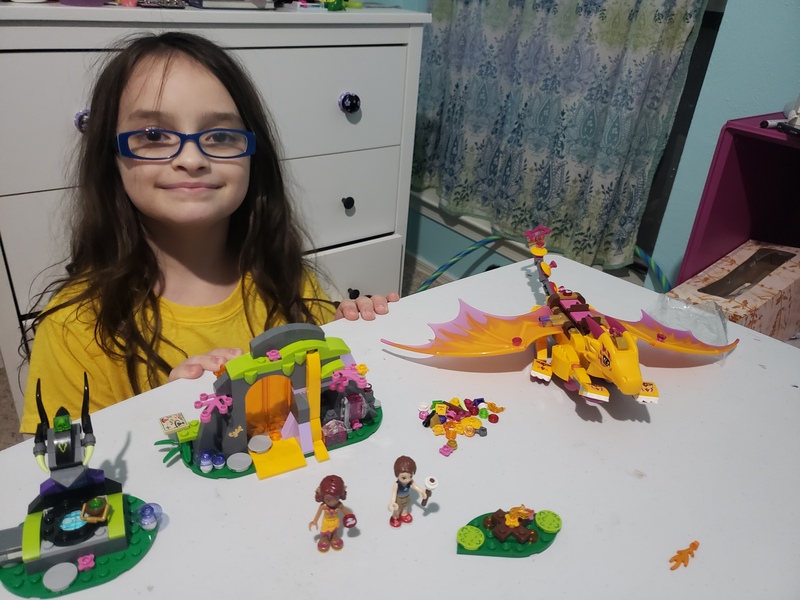 Liesl mostly watched videos, while Luciana immediately broke open her new Lego Elves Fire Dragon set and spent about four or five hours putting the entire thing together. It is a really cool set with great colours and styles. She loves it and it is perfectly up her alley. She needs a lot more of the Lego Elves sets, such an ideal thing for her. And she was able to put the set together all by herself. At six I worked with Valentina for several hours. It was nearly nine when we got done working. While we were working, Dominica was watching The Golden Girls which apparently she was not able to watch while in Houston. She was anxious to get back to binge watching it. Once I was done working, I joined her and ate my cheese and cracker tray. Dominica was pretty tired and was off to bed before eleven. I wasn’t quite ready for bed, so worked on SGL, did some cleaning in the house, and waited for Rachel to come over as she was stopping by after getting off from work tonight to pick up some boxes and luggage and stuff that she has been storing at the house. It was around one thirty when Rachel finally made it over. We talked for probably an hour. She’s having a really rough week and needed someone to talk to. She got her stuff while she was here, she had a lot of clothes, some boxes, some keyboards. She went home and then I got off to bed. Luciana had fallen asleep earlier, Liesl was getting ready for bed while Rachel was visiting. Tomorrow is Friday, a normal work day in the morning. Then Paul and I are going up to Plano in the afternoon to do some on site work up there with a customer. In the evening, the girls have the Carrollton Library Yule Ball event that they have been looking forward to. That will be a lot of fun and something really unique. So we have to make sure that we are able to make it to that. It will be very sad if they miss it.